Thars Gold in Them Thar Hills! Sadly most American classrooms don’t mention gold in relation to North American history until the 1840s are discussed ….you know the drill….American River, John Sutter, Forty-Niners, San Francisco. Three American History books aimed at fourth and fifth grade and two books for high school I have at my disposal all tell the tale of the discovery of gold in California along with the large numbers of people who headed to the region to get rich. Students examine how the gold-miner wannabees reached California. In some classrooms the situation is used to teach a bit of economics regarding the law of supply and demand and of course, Levi Strauss is always brought up regarding his contribution to the blue jean industry. Other points are also brought up. For example, the Gold Rush in California caused discrimination since so many ethnic groups ended up living close together, yet it also increased the population to the point California became a state in 1850. The California Gold Rush a valid point in American history that should be taught. I have no problem with it per se, but what about other gold rushes? What about other great finds of gold other than the one that occurred at Sutter’s Mill? Poor little Conrad Reed is often shortchanged in the credit department regarding history, and I’m really not sure why. I’m mean afterall….one of the ways we interest kids in history is by pointing out that kids make history just as often as adults….and little twelve year old Conrad made history in the best way possible. One day in 1799, while walking along the creek bed on his father’s farm in Cabarrus County, North Carolina little Conrad found a rather large rock….actually it was a nugget of gold, but no one realized it for three years while the nugget served as a door stop. At 17-pounds it was a rather large nugget, and once it was identified as gold, Conrad’s discovery ushered in the very first North American gold rush. Yes, the very first gold rush was not in California….it was in the South. Part of teaching the American Revolution, of course, involves introducing students to the use of Hessian soldiers by the British, but what we rarely tell students is sometimes the Hessians remained in the newly formed United States and contributed to American society in different ways. Conrad’s father, John Reed aka Johannes Reith (one suggested spelling), was one of those Hessians who stayed behind after the Patriots won independence. During the war Reed had actually abandoned his post outside of Savannah and never looked back. While John Reed might have been an excellent farmer he was very uneducated in the gold department and allowed a jeweler to purchase the nugget for $3.50 (a whole week’s wages at that time) and only later discovered the nugget was actually worth $3,600. Not wanting to be taken again Reed began mining gold on his property and soon after a slave by the name of Peter found a 28-pound nugget. At his death in 1845 John Reed died a very rich man. 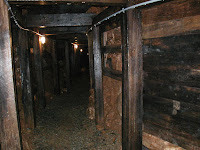 You can visit the Reed Gold Mine site here. American Philatelist has an interesting article here regarding gold mining in North Carolina. You know it’s very easy to teach children about our known history – the collective history we, as Americans, share. There are certain members of our American family that we should recognize and know how they fit into the fabric of our American quilt….folks such as Thomas Jefferson, Jane Addams, or Dr. Martin Luther King, Jr. But what about historical figures that aren’t so well known to everyone – everyday folks who do great things that don’t get into the history books? A friend of mine sent me an email awhile back that sent me off on one of those searches I dearly love and with this search I hit pay dirt. Do you know who Elizabeth Zimmermann is? Well, if you knit or you know anyone who does then she is your girl. Elizabeth Zimmermann, or EZ, as her devoted followers call her, is the undisputed knitting queen for the knitters of the world. 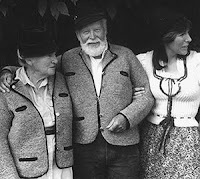 EZ is famous for reintroducing German or continental knitting to people in the United States and Great Britain after it fell out of favor due to its association with Germany during World War II. She is also famous for many other knitting innovations. I have to admit my friend’s inquiry made me want to know the chain of citizenship for Mrs. Zimmermann and how it all went down especially during a time period when relations between Germany and Great Britain (along with her U.S. ally) were so strained. Yet Germans did immigrate….one of the most famous being Albert Einstein. It does seem like they just "eased" on into America. I wrote back to friend after an initial search that I wasn’t really sure what EZ meant by being German….she was English and married a German. Perhaps she meant since she was married to a German she felt German as well. I really don’t know and haven’t discovered what their laws were at the time, but here is a paragraph from her obituary that was published in the New York Times. It does explain the situation a bit more…. Miss Lloyd-Jones [aka Elizabeth Zimmermann] attended art schools in Lausanne, Switzerland, and Munich, where she sold sweaters of her own design to a local shop for pocket money. She also met Arnold Zimmermann, a brewer. He had to flee Hitler's Germany because an SS agent overheard him making a snide remark about Hitler. They married in England, immigrated to New York and moved several times before settling in Wisconsin. Upon discovering this I wrote to my friend, “I’m thinking they were able to get out prior to Hitler closing the borders. Many Germans did this and went to England or America. We weren’t yet involved that early in the war, so there wasn’t really an issue regarding allowing Germans into the country if they were fleeing Hitler. Later everyone was suspect of having Nazi ties and things were more difficult to become a citizen. I have wondered what sort of “snide” remark Mr. Zimmermann made concerning Hitler. I would imagine things were a bit tense for the couple until they could make their way to Great Britain. I also wondered about anti-German feelings as war was about to reach the United States. This website states, “Anti-German feelings rose again during World War II, but they were not as powerful as they had been during the first World War. The loyalty of German Americans were not questioned as virulently. Dwight Eisenhower, a descendant of the Pennsylvania Dutch and future president of the United States, commanded U.S. troops in Europe. Two other German Americans, Admiral Chester Nimitz of the United States Navy and General Carl Spaatz of the Army Air Corps, were by Eisenhower’s side and played key roles in the struggle against Nazi Germany." But on the other hand, after we were involved in the war things changed drastically. Americans with German ties were actually placed in camps much like the Japanese were as this article and this article attest to. I have to wonder how the Zimmermann’s escaped this. Now, clue in on all of the things Mr. Zimmermann could do…..one in particular caught my eye. He could write. In the Lonely Lake/Der Einsame See Mr. Zimmermann not only wrote the text he also illustrated the work with pen and ink drawings, and he provided a wonderful nature study as well as a study of language as English and the German language are both experienced together on the book’s pages. The Tale of Alain is a fascinating coming to America tale with a mouse as main charactercharacter. The book includes instructions for erecting a tipi; a glossary of nautical terms and complete instructions for knitting Alain’s striped sweater, courtesy of Elizabeth Zimmermann, [of course]. Both books can be purchased at Zimmermann’s company site……her daughter now runs Schoolhouse Press. The books along with additional information can also be found here and here. After examining various German-American experiences during World War II regarding those who ended up in the camps, students could surmise reasons why the Zimmermann’s escaped the internment. Students could read the books written by Arnold Zimmermann and learn more online about him and Elizabeth Zimmermann. They could then discuss how the Zimmermann’s seemed to adopt their new country, the United States, but they both seemed to want to keep their German culture alive. Students could also research the stories of other Germans who fled Hitler and compare and contrast the various stories looking for common threads. Students could also research and debate the proposed Wartime Treatment Study Act. School starts in my district tomorrow, and every teacher I know has said the same thing. “Wow, that was a short summer!” Yep, I have to agree. It was a short summer, but like it or not the first day is here and by the end of next week summer will just be a hazy memory in our rear view mirrors. Here are a few previous posts I’ve published here at History Is Elementary that deal with the nuts and bolts of getting ready for a new year…..things on my desk, various forms, and procedures, and one situation where I pulled a solution out of my a……out of thin air when I needed it most. Enjoy! …..and HAVE A GREAT YEAR!!!!!!!!!!!!!!!!!!!!!!!! !